A Pampa man with a distinguished military history was recently buried in Arlington National Cemetery. Lieutenant Colonel Edmund H. Lutz, who died on May 3, 2008, was buried in July. He flew more than 30 missions over Germany and France as a Lieutenant Colonel in the U.S. Army Air Corps. Lutz came to Pampa in 1943 to train at the Army Air Corps Advanced Flying School at Pampa Army Air Force Base. 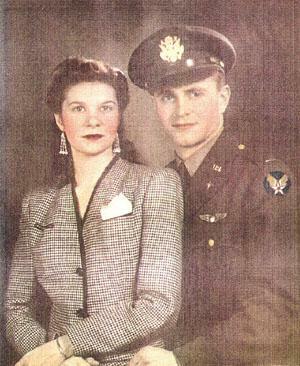 He met his wife, Betty Jean Tiemann at an Army dance reception in Pampa, and they wed later the same year. Betty and Edmund had known each other only five weeks, but they decided to wed before Edmund departed for Europe to fight in World War II. Betty purchased a wedding dress, and the couple approached the base chaplain about their marriage. The chaplain questioned Edmund, asking him how long they couple had known each other. When he replied, “five weeks,” the chaplain said he would not perform the ceremony since they had not known each other long enough. The couple was determined and boarded a train to another town, approached a Methodist minister about the marriage, and the minister agreed to the marriage service, even without Betty wearing her dress. Edmund distinguished himself in service with the Air Medal with three Oak Leaf Clusters, two Bronze Stars and a Distinguished Flying Cross. He flew a B-17 during the war, and after the war, he worked as a test pilot on B-24s and b-29s. Betty remembers some of Edward's adventures in flying over France on D-Day. Ed started off “flying tail-end Charlie,” (last place in the squadron) and eventually moved up to flying the head of the “Flying Fortress” of B-17s. The couple moved from Flordia to Ohio, where they retired. “I liked Texas and he liked Cleveland,” Betty explained. Edmund received an education at Case Westeren Reserve University, where he graduated from in 1951. He had a 30 year career as a staff member of the Cleveland Museum of Art, and also did some work as their designer. He received 39 international printing awards by the time of his retirement.